Jersey features a stunning collection of beaches, many accompanied by a mouth-watering selection of beach cafés and friendly shacks. From north coast harbours and east coast coves to the wide sandy expanses of the west and south, Jersey’s beaches are always busy with locals and visitors looking for their next tasty meal. A legendary outpost on the north-east corner of the island, the Hungry Man is no more than a small shack on a pier with a few accompanying tables and chairs. However, ask any local and you’ll soon find out that this small shack offers some of the finest burgers and bacon rolls in the Channel Islands. With a glorious selection of cakes, fresh crab sandwiches, cream teas and dish names such as the ‘Double Decker Health Wrecker’, this is not a place for the faint-hearted! Expect big weekend queues during the summer. Situated overlooking the small but popular beach of Greve de Lecq on Jersey’s north coast, Colleen’s offers fantastic food at any time of the day. Winner of a TripAdvisor award for excellence and home to big breakfasts, tasty local lunches and the occasional evening menu, Colleen’s is relaxed, friendly and a must-eat during your visit. Tucked away down a small road and opening onto Archirondel Beach on Jersey’s east coast, the Driftwood Café is a true summer favourite. With more seats outdoors than in, and only two steps from the pebbles, this an outdoor beach café in the truest sense of the word. Enjoy breakfast, brunch, lunch, teas and dinner. Whether you’re sitting outside on a summer’s afternoon or toasting by the wood-burning stove in the depths of winter, Le Braye Café is a wonderful place to spend some time enjoying local food and sharing time with friends. Recently refurbished and now very popular with local and visitors, this is a café that offers everything, from simple breakfasts to scallops, steaks and sumptuous salads. 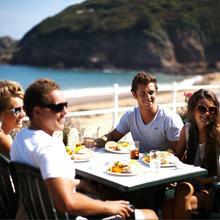 Straddling the line between café and restaurant, The Wayside is a popular café overlooking Jersey’s most popular beach. From fry-ups to delicious homemade cakes and a fantastic specials board, there’s something for everyone. Don’t miss the mixed grill (when available), the fish specials or the banoffee pie! Unashamedly original rough around the edges, The Watersplash is Jersey’s most popular surf bar and diner. This is the venue for surf competitions, music nights and relaxed Sunday afternoons, with a busy bar and a menu full of large, tasty dishes including big breakfasts, burgers, pastas and the best curly fries you’ll ever taste. Perfect for a much-needed meal after a couple of hours in the water. Built into the sea wall and right above the white sands of St. Aubin’s Bay, the Gunsite Café may be small but makes up for it with hearty, tasty dishes. The breakfasts are legendary, and many visitors happily sit outside for long summer afternoons, enjoying special lunch dishes and home-made cakes. Originally opening as a beach café in 1948, El Tico has evolved over the years and is now much more than a simple café. Reopening as a modern beach-side venue in 2009 and subsequently winning an architectural award in 2011, El Tico prides itself on fresh food cooked to order, friendly service and impeccable design. Specials ranging from spicy pulled pork sandwiches, sticky ribs and jungle curry to local moules, crab linguine and smoked haddock chowder. There aren’t many better views in Jersey than the view from this popular café, perched above one of the island’s hidden gems. The café serves one of the best breakfasts in Jersey, and visitors can relax during the afternoon and into the evening with a full menu, wines and beers. Perfect for a Jersey ice cream or a slice of cake after a stroll along the breakwater, the Breakwater Café is a popular local haunt that welcomes many visitors throughout the year. The café is a frequent stop on coastal tours, offering tasty breakfasts, lunches, afternoon teas and dinners. This entry was posted in Jersey Restaurants and tagged Beach Cafes, Jersey Beaches. Bookmark the permalink.